This March, we’re on a savings mission. Research from the Money Advice Service finds that more than half of the UK population (57%) have less than £100 in savings. Interest rates on easy access savings account have falling for a long time, meaning your money has to work harder to generate interest. For an average savings account with instant access, they're now at a very poor 0.33% meaning for £1000 saved, you couldn't even buy a cup of coffee with the interest. Win £330 by telling us how you #MaxYourMoney! We'll update this post with all of the best, most creative, and interesting tips we receive - be it P2P ISAs, personal finance apps, or any other innovative use of a financial product! At the end of March, we'll collate all of the best tips and produce a handy downloadable guide on " How to MaxYourMoney in 2017"! Such as Nationwide’s FlextDirect, which pays 3% on up to £2500. It might only last for twelve months, but finding a 3% interest rate in an account available on the high street will be tough to beat. Peer-to-peer lending might still be relatively new, but lending out your money to others via a platform like RateSetter, Zopa, or FundingCircle can be a great way to get a better return. RateSetter’s basic investment products (the rolling market) pays an average of 3.1% - though remember your capital is at risk. Atom Bank offer a 1-year fixed saver which offers 2% - more than most. Though these rates aren't what they were some ten years ago, locking your money away for a fixed term remains one of the easiest ways to make it work that little bit harder. Apps such as Bean help users find a zero-interest card by analysing spending patterns. Others like Money Dashboard can help you take control of your finances by collating all of your accounts and putting them in one place. Or use apps like Quidco or TopCashBack to get some cash back post-puchase! Companies like ClearScore can help point you in the direction of a better deal on your car finance, personal loan, or credit card. Finding a better deal and paying less interest on existing loans or debt is often the easiest way to save money. These uber-modern apps such as MoneyFarm replace your traditional financial advisor with artificial intelligence led recommendations, and can help you better manage your pension pot/investments. Many settle for currency from the airport bureau de change, but a substantially better rate can be found by using prepaid cards with rates close to the “real” exchange rate. There's plenty of these apps, like Monzo, or TransferWise which can get you a better deal on foreign exchange. These are just seven ways of getting more from your money, but we’d love to hear lots more! Whether it’s just using the Santander 123 Current Account to get some cashback, or something a bit more niche such as a more affordable loan from BTCJam using Bitcoin, or a robo-advisor to guide you on your investment portfolio - let us know! 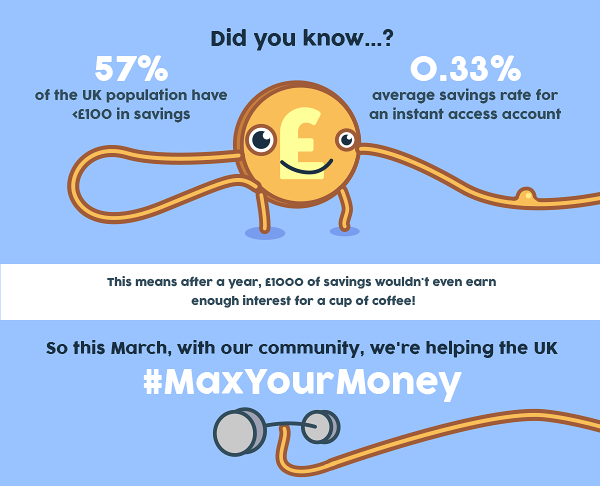 Tell us how you #MaxYourMoney and beat the savings rates, and we’ll give one lucky winner an extra £330 to deposit in their savings. Just leave a review on our site, telling us which product you use to get a better rate than 0.33%, and the £330 could be yours!